Do you find yourself taking home hours of work each night? Is your family time being eaten up by grading and lesson prep? If so, you’re not alone. So many teachers take home loads of work each night, yet others somehow find themselves going home empty-handed. What’s the difference? While you may be tempted to say this is due to laziness or a lack of effort (which, unfortunately, is sometimes the case), that’s not always true. Some teachers have really learned the art of being ultra-efficient while they’re at work…..so they can take less home. Now if you’re a first year teacher, you’re not gonna’ be there yet. My first year I had to take home work at least every weekend, if not every day. It’s just unavoidable in that first busy year. But once I had taught the same classes for a year or two, I got to the point where I hardly ever took any work home. This allowed me balance and the ability to spend the time I wanted with my family. If this sounds like an impossible goal, then this series is for you. I’ve been wracking my brain, trying to figure out exactly how I got so much done at school while my colleagues (who were excellent teachers, by the way) still took mounds of papers home. Now before we get into the tips themselves, I have to offer a disclaimer. I’m going to be giving you tips to help you be more productive and to save time, but in all things, we have to have balance! Sometimes my drive to get things done causes me to walk right by a hurting student without even noticing or to rush through a conversation that needed more of my time. I talk more about this struggle in my post “What to Do When Things Get Crazy,” but I am always fighting this tendency. And I want to say up front that people are always more important than our to-do list. So our goal should be to save time & be efficient so that we have more time FOR people….and that means we always need to keep one eye out for others, even as we try to put our head down and make some progress on our mountain of grading. 1. Don’t grade everything. If you are grading every piece of work your students do, I have one word for you. STOP!!!! This is way too overwhelming & takes way too much time. What you want to do instead is to collect work randomly and tell the kids that any piece of work they do could be taken for a grade. That way, they have the incentive to always try their best, but you’re not buried in paperwork. 2. Make the most of your work times. I realize this is easier said than done, as it seems like something is always coming up, but try to really buckle down & work during your “free” hours. Don’t waste the first ten minutes on Facebook or a leisurely walk down to the lounge to get coffee. Get focused right away and get done as much as you can in those precious, fleeting minutes. 5. Forgo the elaborate decorations and visuals (at least for now). If you find you’re spending hours on the perfect bulletin board or a new, fantastic helpers chart, it’s time for a paradigm switch. I know these things are flashy and showy, but they don’t really help your students learn any better and they can take A LOT of time. You can make your classroom fun and colorful without spending hours on the decorations. Think pre-made posters (like these), student work, etc. I remember in college they taught us how to create our own art by blowing up a picture with an overhead, tracing it with permanent marker, and coloring it in with chalk. This took hours and hours….and there’s just not time for this…..at least not if you’re taking a bunch of work home. If you really love this side of teaching, then keep it as part of your day, but consider scaling back until you get your time more under control. Once you’re more efficient and have more time, you’ll be able to do more. 6. Focus on efficiency, not speed. If you’re anything like me, when you try to rush & get a task done quickly, you make mistakes. Then you have to go back and correct them, and you end up not saving time at all. In fact, often you end up taking even longer. Instead, focus on efficiency. Have a stack of grading? Try to be efficient – that means working at your maximum productivity. So be focused, don’t get distracted, and work to the best of your ability. But don’t rush. Now I don’t take any shortcuts for quizzes and tests. On those, I take the time needed to go through each problem & give partial credit. This takes a lot of time, but it’s worth it to me. The key is to prioritize – what is truly worth the time and what just needs a quick grade in the gradebook? 8. Ditch the rubrics. Another way I saved time with grading was by being creative with my grading sheets for writing projects. I created a grading sheet that consisted of all the things I expected of them. I then circle everything that is incorrect or subpar and put a check mark or smiley face by everything they did well. I don’t use a rubric on the grading sheet….I either grade hollistically or have a rubric in my head. Not having to do the math saves lots of time, and the circles and checks justify the grade well (while also keeping me from having to write out a million notes). I explain this method in more detail here. 9. Keep track of your lesson plans from year to year. We all know that every time we teach a new course or have a new curriculum (or have to learn Common Core), everything is more time-consuming. But be diligent about taking those extra few minutes to keep track of what you’re doing this year, what’s working well, and what’s not. If you have it all in one place at the end of the year, you’ll thank yourself a million times over when you don’t have to reinvent the wheel next year. 10. Organize your files (both physical & digital). Okay, you knew we were gonna’ get to organization. I’m not saying you have to be uber-organized. I’ll be honest – my storage closet was a bit of a mess. But the things you use most often – the files you always need to access – those need to be organized so you don’t waste time searching high & low for something that should be right there. (Okay, this still happens to me too often because sometimes I’m not paying attention & put something in the wrong place. But the more organized I am, the less this happens.) And your computer – don’t keep every document you have in “My Documents.” Have a folder for each course, then within that course, a folder for each chapter or section, etc. Make things easy to find so that you’re not searching & searching & searching &……. 11. Master copy & paste. When writing lesson plans, crafting emails, or developing assessments, get in the habit of asking yourself, “Did I already create something similar?” If so, find it, copy & paste, and then tweak. I use this especially with emails. How many times have you emailed a parent about a student not doing his homework? Craft a generic email template & keep it somewhere. Then, whenever you need to email a parent, start with the template & customize it to fit the situation. I explain how to do this in more detail here. 13. Enlist help from parents, teachers’ aides, friends, and family. Students can be a great help, but there’s some things they just can’t do – like grade their own tests. For more advanced tasks, enlist some help. And train your help!! Teach them exactly how you want a task done so that you don’t end up having to redo it. And don’t be afraid to gently redirect them when they don’t do it quite right – this extra effort will pay off when they can soon do the task as well as you. 16.Give the impression that you grade more than you do. While we want our students to do their best every time, there is simply no way we have time to grade every piece of paper. Here’s a great solution: collect papers all the time but either put them directly into your outbox or flip through them and put check marks and smiley faces on the ones that look pretty good at a glance. This takes about 1 minute and makes the kids feel as if their work is being noticed and valued. 17. Find an efficient way to deal with absent work requests. Absent work requests can start to really make a dent in our time, especially when the flu’s going around. Come up with an efficient way of dealing with them – a way that will take you the least amount of time possible. For me, my simplified week-long lesson plans fit on a single sheet of paper and include homework, tests, quizzes, and an overview of what lessons & topics we are covering. I simply hit print and staple it to the request form or copy & paste it into an email. Attach any necessary worksheets, and I’m done. This may not work with your system, but find something that does. Something fast. Something efficient. 18. Get up a little earlier. Ahhhh, I know these are like the words of death. Get up earlier? Are you kidding me? I get up so early already! I know, I hear you. And I’ll be honest, while I was teaching I didn’t really do this, but since I’ve transitioned to staying home with my little one and writing, I’ve started to make this a priority, and wow has it helped me be more productive! Even just 15-30 extra minutes in the morning when you’re fresh can save you 30 minutes to an hour of work in the evening. The morning time is just so much more productive. So when your alarm clock goes off early & you want to hit snooze, imagine yourself relaxing on your couch that evening or getting to go to bed early. 21. Don’t agonize over the possibility of a typo in emails. Now I know that we teachers want to be accurate & professional in all our interactions (and we should be). But it’s not worth our time to scour our emails over and over in search of an elusive typo. Typos happen. They are part of life. And parents understand. Now, there certainly shouldn’t be a ton of them, but a typo here & there are going to slip through, and it’s just not worth our time to read each email 6 times just in case. 22. Don’t double-check your grading key. When you write your own test, don’t bother to double-check your answer key, especially for math problems. Instead, grade your best student’s test first, and double-check any answers they appear to get wrong. You should be able to catch any mistakes pretty easily – and take much less time than it would to rework every problem. 23. Learn how to better use your computer. If you’re not that comfortable with your computer, you will do yourself a huge favor by learning how to use it more efficiently. Consider taking a computer class over the summer or simply ask a more tech-savvy colleague for some tips. The better you know how to use your computer, the more efficient you’ll be and the more time you’ll save. Here’s my favorite time-saving computer tip: The more you can stick to the keyboard (as opposed to switching from keyboard to mouse back to keyboard, back to mouse, etc. ), the faster you can work. So, to switch from window to window (for example, from the internet to Word), hold down Alt and hit Tab (on PC’s). You can then tab through all your open windows. Try it. Pretty cool, huh? I share more time-saving keyboard shortcuts here. 25. Pray for clarity & efficiency. I listed this one last, but it is by no means the least important. Without God, we can do nothing. He is our strength, our help, and our rest. He can and will give us clarity and help us work more efficiently. And if we’re listening, He’ll also help us balance our lists of tasks with our greater purpose: helping our students. Do you take home hours of work a night or find a way to get most of it done at school? 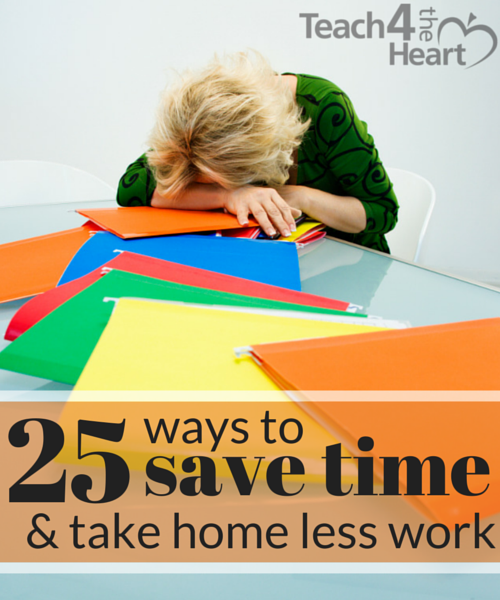 What helps you be more efficient? Scroll down or click here to leave a comment. I have 5 more things.1. Stop talking when the idea is finished. 2. Throw out 10% of your lessons that don’t work. 3. Take more time with the students- listen better. Talk much less.4. 80% of the curriculum will remain in your 35 year career- only sweat the 20%. 5. Lighten up–work on inspiration rather than perspiration. I am an intervention specialist. I teach all self contained classes (reading, world history, job skills). I can get my gen ed teacher duties done at work but I spend hours writing IEPs and progress reports. Maybe you can create editable templates for your reports, notations, parent discussions or communications (for those that are nearly the same). You can create an editable IEP template. If you have similiar or the same type students each year you can take IEP’s already written and edit them for the next student. Thank you for all these ideas!!!! They are really usefulll! !